Both valid and both important in our society. However, options 3 and 4 touched my heart/soul deeply and I knew that these options were to be the focus of this month’s mandala of the month. While coloring this month’s mandala, explore the possible reasons we judge others. More importantly, pay attention to how much and how often we judge ourselves. How tolerant are we of others? How tolerant are we of ourselves? Set an intention to receive guidance on how best to be kind to ourselves and others. Ask to be shown the positive qualities of ourselves and others. Ask to be shown how to be more tolerant of ourselves and of others. Be aware of negative judgements as they happen and immediately focus on something positive about what was just judged. It’s easy to focus on all the horrible things that are going on in this world, especially with 24 hour news programs and the web. It may seem daunting to turn this around to find a way to love humankind. And yet if we take the time to look, there’s a lot more to love in this world than we realize. If we want to love humankind, it has to begin with us. Until we learn to love ourselves, it becomes almost impossible to TRULY love others. It may be easier to love the IDEA of humankind first. That each of us comes into this world with our own agenda full of Love and Light. Then with each passing day, our inner light becomes layered with a wide variety of experiences, both negative and positive, that shape our life here on this planet. When we remember that we are whole and complete just as we are and that the rest of humankind is also whole and complete, we can begin to look past the surface and see the Love and Light in all of us. As you color this month’s mandala, ask to be shown the Love and Light of humankind, ask to be given guidance on how best to experience it, starting with our own Love and Light. 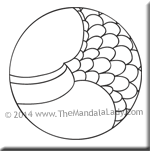 Ponder this as we color the August 2014 Mandala of the Month. Be sure to download Section 8 of the 2014 Mandala of the Year.